Photograph showing J.R. Miller holding his daughter Josephine Miller (Lynn) next to his wife Mary Miller. The photograph was taken in front of their residence at the intersection of Muhlenberg and Spring Streets in Woodstock Virginia. Unknown, “J.R. 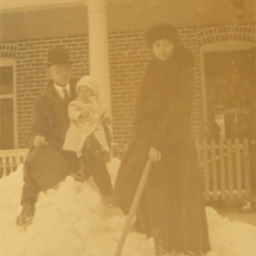 Miller, Josephine Miller, and Mary Miller,” Shenandoah County Library Archives, accessed April 19, 2019, http://archives.countylib.org/items/show/11415.